Home / Drill Press Reduction Kits / Drill Press Reduction Kit, lower RPM, more torque! 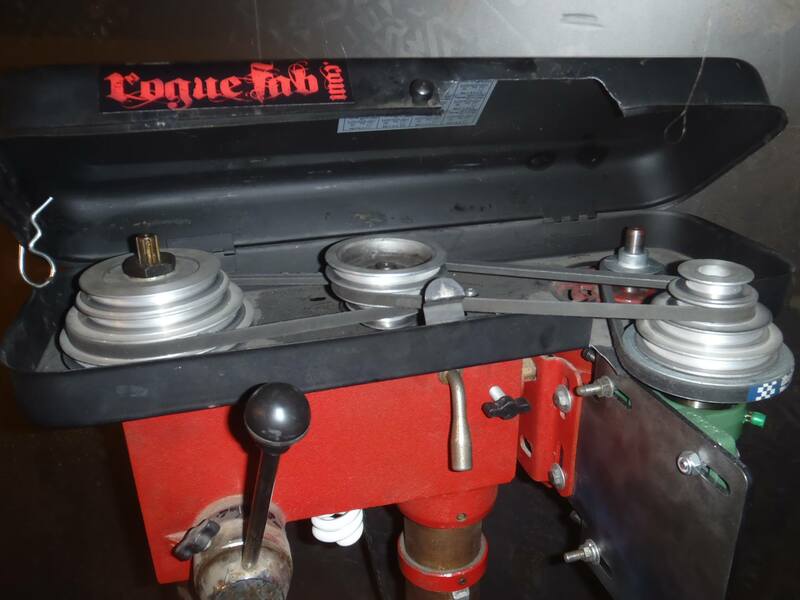 Belt Width Choose an option1/2" (default)3/8"
Want to slow down your drill press? This bolt on kit will double (2:1) or quadruple (4:1) the torque of your drill press at the spindle and cut the RPM by 50-75% (2:1 – 4:1)! Kit bolts on in about 25 minutes with hand tools. Requires trimming of your belt guard if equipped. You may have to purchase a separate belt if the one we provide does not fit. Works with nearly all drill presses. 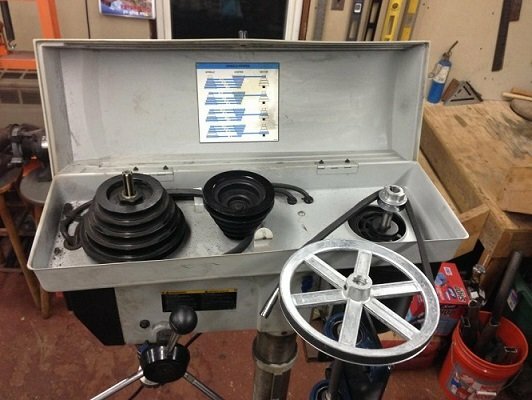 Click on the Tech link below to find out if your drill press works with this kit. This kit uses cold rolled steel shafting, high quality cast-iron block mounted greasable ball bearings, and ships raw (the main plate is not painted). 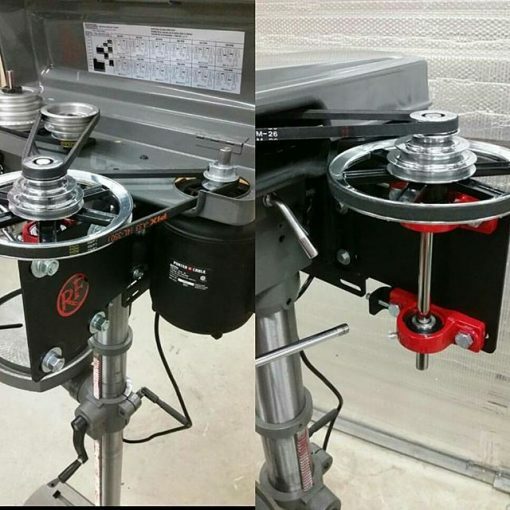 If want your drill press to go slower and have more torque, this is the kit you should order.The 4:1 is our most popular kit, and the one we almost always recommend. Also, it is very important that the shaft size of the kit you order matches your drill press motor. The belt size of the kit doesn’t need to match your drill press at all. 6 reviews for Drill Press Reduction Kit, lower RPM, more torque! I have had the DPRK installed for a few years now and it has been a great addition! Next to good bits and a good chuck, the DPRK is about one of the best things you can do for a little drill press like this. I've used it for hole saws, a Procunier No 3 tapping head, and drilling thousands of holes and it hasn't skipped a beat! I've had my DPRK for about 3 years now. It works awesome. Was able to take an under $200 drill press from Lowes and make it into a decent metal cutting machine. I've even been able to use the DPRK to set up the speed good enough to mill some aluminum. Highly recommended if you have a wood cutting speed press and want to be able to cut metal too without having two machines. I'm very pleased with my 4:1 kit. I received it rather quickly, from a very nice and helpful sales rep (Skyler). The kit included everything I needed and so far it's perfect. I put it on a Jet 14" bench drill press that had a slow speed of 450rpm. I'm now down to a cool 112rpm, and ready to start doing a bit of custom fabrication of my own. I build lightsabers, and I have always hated being at the mercy of shapeways and other suppliers for the little parts that I need. Now hopefully I can make them myself. Thanks very much for the quality kit! I'll report back later after i've had a chance to use it for a few months. But so far so good. The only thing that I'd say to be aware of is that this kit is not a 30 minute simple bolt-on job. 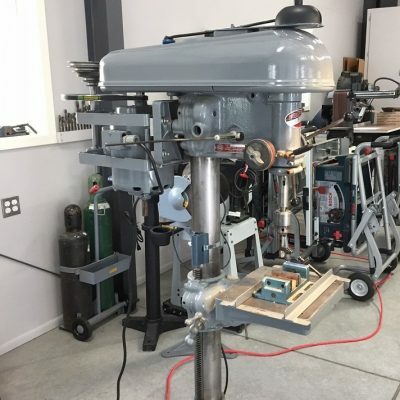 It requires a fair amount of consideration and time spent figuring out how to apply the parts to your specific drill press. It's a generic kit, so it isnt going to fit on every press the same way. Each installation will be different. It's up to the buyer to decide where to put each pulley, and at what height. 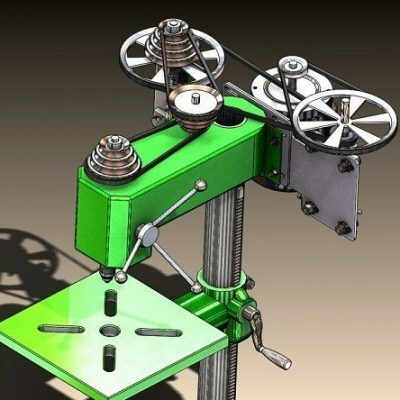 You may have to flip some pulleys over, or mount them at different locations. But you have all the pieces you'll need, it's just a matter of installing them in a manner that will work on your drill press. I'd attach some pictures if I could, but I don't see a spot to do so. Thanks guys! 5 stars for the Drill Press Reduction kit! I used the kit materials and the instructions as a guideline and created what, for my purposes, is a great machine. I had a $59 Central Machinery (Harbor Freight) 5 speed 8 inch drill press which I decided to soup up. I bought the RogueFab kit and, separately, bought a 6 foot 1 13/16 inch (about 46mm) steel tube and one other 2" pulley. The motor came off pretty easily and I put the plate on so that the added pulleys were to the left of the machine as you look at it. To tighten everything up I clamped together the headstock frame and the plate then installed a hook and eye to replace the clamp. Put the pulley I bought separately on the motor axle (I believe it was 13mm so I had to bore out my 1/2 inch pulley) which went over to the 8 inch RF pulley which turned the small supplied pulley. From there it went to my "quill" axle (if I'm using the proper terminology) where I had bored out a 4 inch pulley I bought from RF to fit the roughly 7/8 inch (22 mm) axle. A good thing to remember if you're doing something like this is to be sure to get the zinc pulleys as they are very easy to bore out. The only other type I found were cast iron and I didn't want to try to alter those. The end result is I have a standing drill press (with ceiling attachments so it won't fall over) that runs in the 300 rpm neighborhood (don't quote me on that, may be lower) that's got great torque. One other thing, just forget about trying to put the top cover back on. It would be cut up like crazy and have trouble staying on, I would imagine. To sum it all up, this is a great kit! Buy it and have fun with your project. First I would like to thank rogue fab for their amazing customer service. I placed my order Friday for next day delivery, after the mailing cutoff via Internet. I received a phone call a few minutes later telling me I had missed the cutoff. They told me it wouldn't get to me until Tuesday and asked if that was ok or if I wanted a refund. Monday morning I get a delivery with my drill kit!!! On top of the fast shipping it also ended up costing more than I paid. So I called rogue fab and they told me don't worry about the difference. Absolutely amazing customer service!!! On to the reduction kit. I have a project of drilling around 300 1 1/16" holes into 1.5" schedule 80 316ss pipe. Building handrails for my boss. I was only getting 2 or 3 holes per bit before this kit, now I'm getting around 20 holes per bit. This kit is well thought out and came with every thing, including great instructions.